We’ve already seen the good side of Swedish car manufacturer Volvo after it launched a beautiful colored book as a tool to continue its fight against plastic pollution and help the oceans keep their waters clean. Atta boy, Volvo! Now, during our weekly #ThrowBrandThursday column, we’re going to present another side of the automaker. Other car manufacturers will say that Volvo has a bit of a devilish side, but if you allow us, we’d show you that this side is indeed a bit trickier. We would not go that far to call it “devilish” because we appreciate one of the brand’s older ideas—one that was also highly-applauded by prestigious creative festivals around the world—very much. To show just how proud the automaker was about its then-newly-launched XC90 T8 hybrid, Volvo didn’t settle down for a simple ad. Oh, no. The Gothenburg -based company, in partnership with creative agency Grey and under the careful guidance of John Militello, found an ingenious way to power its car. We bet that committing robbery isn’t what went through your head. Volvo wouldn’t do that, would it? In fact, the automaker is surprisingly the king of thievery. One could say that it’s like a modern Robin Hood, only that it didn’t steal from the rich to give to the poor. It stole from the rich to keep it to itself! The XC90 T8 is one of the most powerful Volvos ever built. The car is designed to use its power in a smart way. Inspired by this feature, the creative team felt that they have to show the world how easy is to power the XC90 T8. You either go to a gas station and fuel your car with gas or electric energy, but this is now the traditional way, the boring way. The other option you have is to steal energy. But not from the gas stations. If you were to use Volvo’s recipe, you’d steal from other cars. More nicely put, you could commit a “Highway Robbery.” Just check out Volvo’s clever idea to steal energy! To take energy that it’s actually not theirs, Volvo had to set up an installation that helped them complete their “malefic” plan. The automaker created a system that captured the energy and dispensed it across a Southern California highway. Every time a car passed by, water was pushed into a generator, which was then transformed into energy that powered the Volvo car. “A peristaltic system was developed to capture energy from cars using only hydraulic power. A mat containing tubes of water served as the main component. 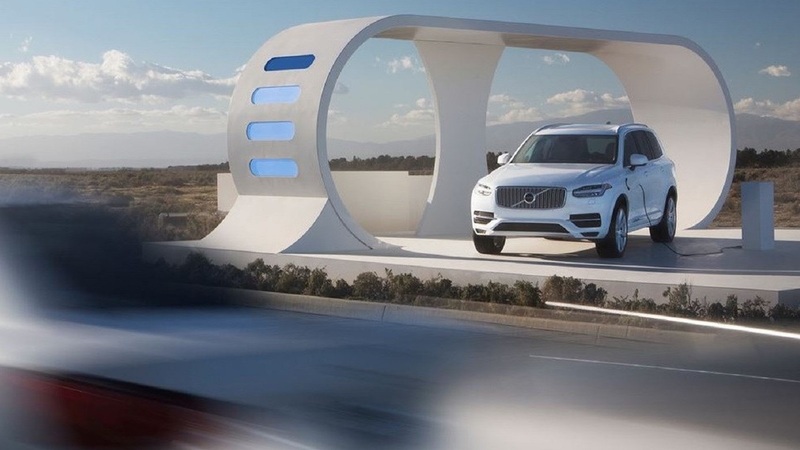 When a car drove over the mat, it compressed the tubes and its forward momentum pressured the water through, generating hydraulic power, which was converted into electricity and used to fuel the Volvo XC90 T8,” said Militello in a press release. The cars that participated in Volvo’s experiment without their will were then saluted via a giant billboard. “Thanks for the extra miles, Jeep,” or “Thank you, blue Volkswagen” were some of the messages that appeared on the big jumbotron. The campaign scooped one Silver and two Bronze Cannes Lions, one Clio, and three One Show Merit Awards. The initiative really “stole the show:” it generated more than 71 million total media impressions. This means that it amassed 5.3 million video views in two weeks (2.6 million on the 15-second teaser and 2.7 million on the 2-minute-long version). Lastly, more than 200 articles from 40 different countries referred to this campaign. Nice way of stealing the show, Volvo!